You can register now for Dave Elman’s Best Practices. Larry Elman, son of Dave, and his wife Cheryl are coming to the Netherlands! Cheryl and Larry are known for their personal approach, their knowledge and their incredible sense of humor. Do you want to improve your skills or learn new skills, then don’t miss this opportunity! 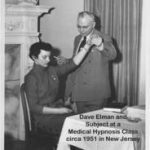 Learn Dave Elman’s incredible hypnosis methods, which were taught to thousands of Medical Physicians and Dentists in the 1940’s – 1960’s. This 2-day Best Practices of Dave Elman Course has been taught to students from around Europe, Australia, Brazil and the US by H Larry Elman and Cheryl Elman. Larry Elman will bring depth and understanding of his fathers methods, obtained through attending his course three times, and growing up watching the evolution of the course as it changed with the feedback of its physician and dentist students. Cheryl and Larry Elman create an energetic, humorous and dynamic duo which makes this class both fun and informative. Time flies by. You will leave this class with confidence in your mastery of the Dave Elman Induction and other methods. You will receive a 60 page Manual of the course which will continue to be a reference for years to come. You will learn how Waking Hypnosis allows you to use your hypnosis skills in locations and situations where trance states are not appropriate, including giving presentations to civic groups or schools. When you know the subtleties of hypnotic semantics the effectiveness of your suggestions, your deepeners, and your other procedures become much more reliable and effective. Also included are hypnosis for children, the Esdaile state, regression, pain management, Process Method technology, and other items to improve your interface with the medical community, and much more. Build onto your own Hypnosis Skills and increase your confidence practicing these proven techniques! What are the costs: 595 euro, this is including tax, coffee/tea/lunch, manual and certificate. Early bird discount: register before September 7th and you will get a discount of 100 euro’s. The training will cost you only 495 euro!